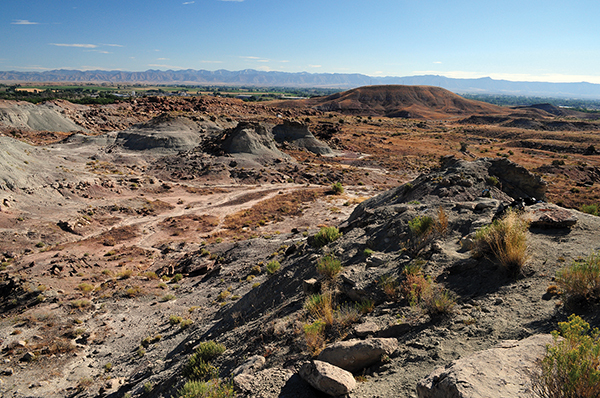 Discover scenic Callison Quarry, just three miles from the museum in the Fruita Paleontological Area. Probe through the soft shale and use your detective skills to spot lizard and pterosaur bones, mammal jaws and teeth, and perhaps even the rare crocodilian Fruitachampsa. This quarry is world-famous for having some of the smallest contemporaries of Jurassic dinosaurs. A short hike from the parking lot to the quarry is involved; it is moderately steep in places. Participants should expect to be outside, in the heat and bugs, working on open, rocky ground. We will provide some shade tarps. Minimum age: 7 • Ages 16 and under must be accompanied by a paying adult.